WHO: Ernst Lubitsch directed this. Lubitsch's aim of creating a film that would capture the complexity of the era and be remembered long after other films of the period were forgotten was, in a sense, perfectly realized. "What is the only picture," Lubitsch asked, "that is still remembered from the last war? It is not Griffith's Hearts of the World, or any of those sad ones. It's Chaplin's Shoulder's Arms." 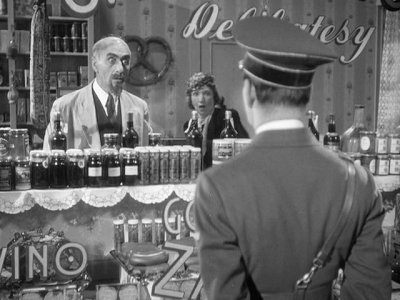 Lubitsch knew that laughter expressed the health of a society, and that the task of the filmmaker was to create a reality that violated the neat boundaries we tend to draw between comedy and high seriousness. And in offering us (or, I should say, offering up) Greenberg, Lubitsch made telling allusion to the doubly vanished Jew: the Jew who was then disappearing from Europe, and the Jew who, in that otherwise noble era of classic Hollywood cinema, ad all but disappeared from the American screen. WHERE/WHEN: Tonight's 7:30 PM screening ends a short run at the Stanford Theatre. WHY: To Be Or Not To Be is far too infrequently revived on Frisco Bay cinema screens. It's played at the Stanford a few times over the years, but I can't recall it playing other venues for quite some time. It was even left out of a otherwise-substantial 2007 Lubitsch retrospective at the Pacific Film Archive for some reason. The most recent screening I can think of outside of Palo Alto was in 2004, when it screened as part of the San Francisco Jewish Film Festival. Unfortunately I missed it then. The 2013 SFJFF doesn't include any films from the classic Hollywood era, but it does have an expansive program of films (and television) by and about Jews from all over the world. Lincoln Spector has already previewed a few of the selections, but he hasn't seen the three films I'm most excited about, all of which coincidentally screen on the same day at the Castro Theatre, July 29th. These are Jerry and Me, an Iranian filmmaker's essay film on her personal connection to the comedy of Jerry Lewis over the years, which screens with another documentary about Jews in Iran Before the Revolution (not to be confused with the Bertolucci film from 1964.) And The Last Sentence, a drama about Sweden's shameful neutrality during World War II, directed by one of the most respected veterans of that country's filmmaking scene, Jan Troell, who is expected to be on hand for the Castro screening of the film- an event the auteur's fans will want to take a Monday afternoon off in order to catch. Last but not least, First Cousin Once Removed, an exploration of Alzheimer's made by one of America's most under-appreciated documentarians, Alan Berliner (his insomnia doc Wide Awake is tremendous, and what I've seen of his early experimental collage films are great as well). Berliner will also be at the Castro in person to receive the SFJFF's annual Freedom of Expression Award, and it's hard to think of a more deserving man. HOW: To Be Or Not To Be screens via a 35mm print, on a double-bill with Preston Sturges's Unfaithfully Yours. Another scholar, Scott Eyman in his Lubitsch bio details the financial shenanigans which United Artists used to claim the film lost money even though it actually made a profit. So while some folks were understandably sensitive at the time (also because of Lombard's recent death) the story that it was a "flop" needs to be nuanced somewhat. Thanks for the research, Larry! I guess the important thing is that it was (perhaps due to studio manipulations and a shortsighted tendency to pay no attention to critics outside New York) perceived for many years to be a flop.